SRINAGAR, India (AP) — Anti-India rebels in disputed Kashmir raided over a dozen homes of police officers and abducted three whose bullet-riddled bodies were recovered Friday, officials said. Also Friday, Indian government forces killed five suspected militants, ending a two-day gunbattle. 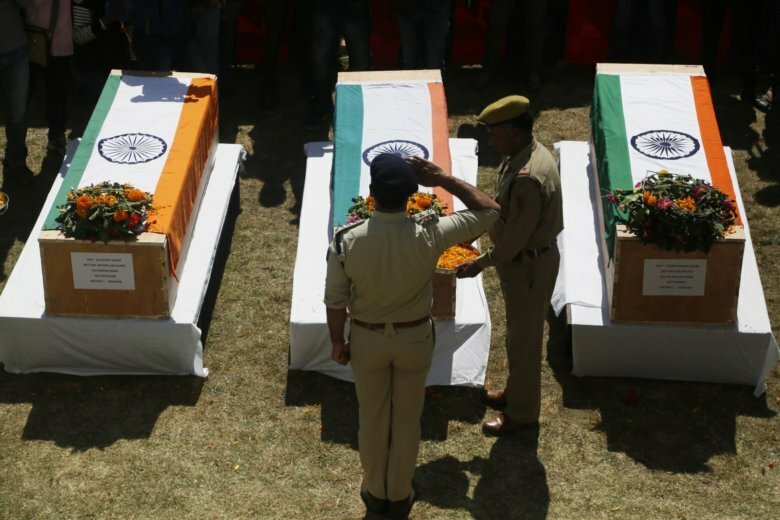 The police killings came days after the region’s largest rebel group asked officers to quit the Kashmiri police force and stay away from counterinsurgency operations. Militants in Kashmir have increasingly targeted police working with India’s forces, accusing them of being collaborators. Early Friday, nearly two dozen rebels stormed the homes in two southern Kashmir villages, took away three off-duty officers and a fourth person who had resigned from the police days earlier. The three were shot dead and the former officer was released unharmed, police said. “We’ll deal with it. They shall be brought to justice,” he said. Last month, militants abducted 11 police and their family members in southern Kashmir after government forces detained several relatives of the militants and set ablaze at least two of their homes. Video of the abductees was released to social media, reportedly by militants, asking police not to harass their families. Riyaz Naikoo, operations commander of Kashmir’s largest rebel group Hizbul Mujahideen, claimed responsibility for the abductions and demanded the release of family members of all militants in police custody within three days. Police quietly released Naikoo’s father and some other relatives of militants, who later set free the 11 people they snatched. “You forced us to kidnap your kin to make you feel what we feel when police harass our families. How a mother would be feeling when her son is taken away. We also abducted them to let you know that we are capable of reaching them as well,” Naikoo said in the widely circulated audio, warning local police to stay away from India’s anti-rebel operations. Hundreds of thousands of Indian government troops, backed by tens of thousands of local police tasked with patrolling the streets, gathering intelligence and profiling anti-India activists, have maintained tight security control throughout the region. Initially in the early 1990s when the anti-India rebellion peaked, Kashmir police were hesitant to be drawn into the counterinsurgency following attacks on them and their family members. However, they soon felt demoralized and caught in the middle between the Indian authorities who employ them and the friends and neighbors who question their loyalties. Several policemen have recently quit their jobs following the killings of colleague and threats from the militants. The killings have created fear, particularly among lower-ranked policemen called Special Police Officers, or SPOs, who are mainly recruited for counterinsurgency operations. Local reports said nearly a dozen SPOs announced their resignations through social media by uploading their videos and informing their neighborhood mosque committees. Also on Friday, the Indian army said soldiers killed five militants in a two-day gunbattle in a forested village in the northwestern Bandipora area. The fighting began Thursday after soldiers cordoned off the area. Soldiers suffered no casualties in the fighting, the army said.